The current bull market will soon become the longest ever. Going forward, however, the supply and demand for stocks constitute a challenge. We already have pointed out some big macro trends that have supported the financial markets for years and are bound to turn in coming years. In particular, economic growth, almost everywhere, has been aided by swelling government debt. We can think of it as “borrowed growth,” facilitated by a decline of interest rates to record-low levels and excessively easy money policies driving market valuations higher. All of those factors are at historic extremes, and have less and less room to continue in the current direction. Although these forces may already have run their course, momentum has helped propel the market ever higher despite five consecutive quarters when the S&P 500’s earnings declined — the longest such run since the Great Recession (just interrupted by anemic growth in q3 2016). The stock market, like any free market, is driven by supply and demand. Who are those buyers of all the stocks, bonds, etc.? Are they the 20-year-olds looking for their first apartment with few roommates, often burdened with car loans, credit card loans, student loans? Are they the 30-year-olds with kids at school and a second mortgage? Probably not. They tend to be older, more established, and getting closer to retirement – the famed baby boomer generation. Their earnings power is at its peak, and they are taking advantage of all possible tax deferred retirement plans. They are on the demand side, and the numbers are staggering! We are talking about more the $14 trillion stashed away in traditional IRAs and 401(k) plans alone according to Time.com (1). 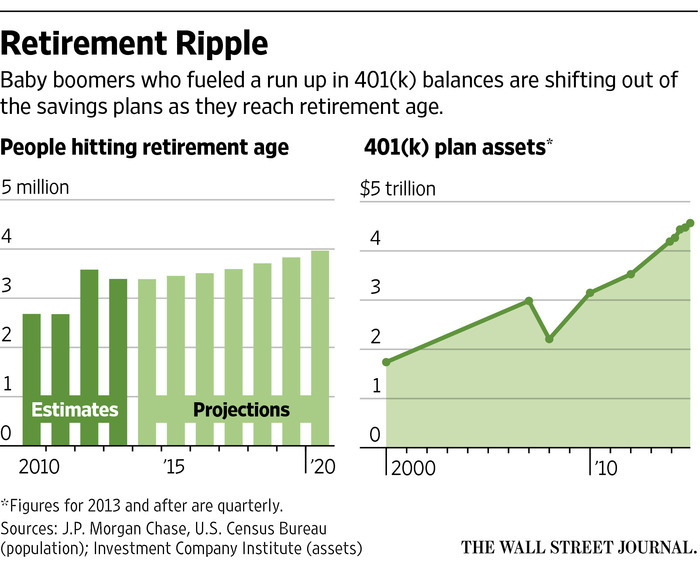 The amount saved outside of the retirement plans could put the total even higher. Is that meaningful? The US stock market is worth over $20 trillion, and US bond market around $40 trillion, while baby boomers hold half of the assets according to the Congressional Budget Office. It’s not only a US story. The Telegraph quotes Pinch, a book by David Willets, which claims that half of Britain’s wealth is owned by baby boomers, (2). The majority is owned by those over 65. We know now who the buyers have been historically. What we are curious to know is whether they plan to remain buyers for long. Between 1946 and 1964, 78 million people were born in the US, and they started turning 70 this year. When they retire, they stop saving, and start living off their retirement nest eggs. Is it already happening? The Wall Street Journal in mid-2015 reported that 2013 was the first year when investors pulled more money out of tax deferred accounts than they put in — $11.4 billion, to be exact vs. $12 to $22 billion net contributions in previous years (3). That trend will only accelerate in coming years. The article mentions that the outflows will continue through 2030, after peaking in 2019. Needless to say, with the market at record highs and of the biggest bull markets behind us, this may be a compelling time to increase those withdrawals. 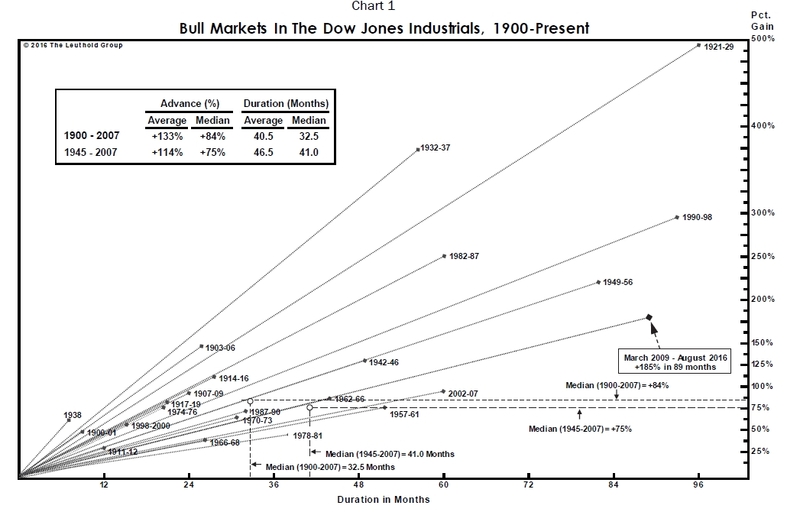 We might be enjoying what will soon be the longest-ever bull market (yes, we are catching up with bull markets of the 1990s and 1920s! ), but the baby boomer generation has recently witnessed some major downturns in the market. Memories of the 2008/2009 recession, and the biggest market sell-offs in decades are still fresh. Similarly, the burst internet bubble of the late 1990s alarmed many investors, and hasn’t been forgotten yet. Needless to say, the closer we get to retirement, the more conservative we become — as we should. Our investment horizon shrinks, and we care less about doubling our assets over the next 5-10 years than about keeping enough to cover our growing expenses. With that in mind, we should expect baby boomers to move away from stocks, and increase their bond and cash holdings to reduce exposure in case of a market sell-off. This doesn’t bode well for the stock market, does it? What about the supply? We know there are buyers, but has there been enough to buy? Every two weeks, over 150 million people in the US (working full-time and part-time) receive a paycheck. 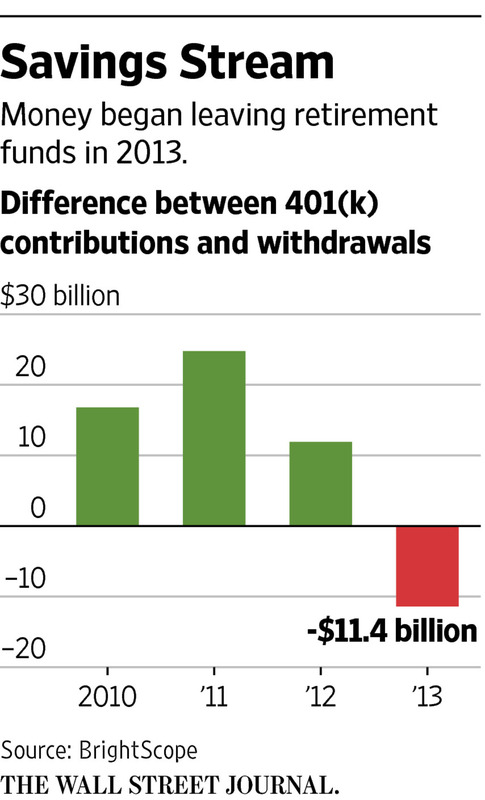 Many automatically deduct and put some cash away in their IRAs and 401(k)s to invest in increasingly passive investment funds. In effect, they buy a little bit of almost anything out there that is publicly traded, and large enough to be bought in big quantities. To satisfy that investing appetite, we’d need more new companies of size going public, but where have they been lately? The number of US IPOs (“Initial Public Offerings”) has fallen to the lowest level in 7 years, according to FactSet. Some blame market volatility, some poor performance of previous IPOs. If we look at emerging tech IPOs, CNBC reported in October that 2016 is the weakest year for that category since the financial crisis, and potentially second slowest for venture-backed companies since 1980 (4). There are no big billion-dollar tech IPOs on the horizon. As an example, Uber and Airbnb are enjoying high valuations and unlimited private capital, and are in no rush to go public. According to CNBC, first quarter of 2016 saw a 25% drop in VC funding, the steepest decline since the dot-com bust in early 2000s. (5) With smaller pipeline of VC-funded start-ups, the near-term prospects for tech IPOs don’t look much better. At Sicart Associates, we never rush to buy hot IPOs, preferring to see them prove themselves before we step in. With limited supply of new companies though, we are experiencing a shortage of newer businesses to choose from. Not long ago I was having a quick lunch between dives in Antigua and admiring some oversized yachts in the marina, when someone told me that the biggest one belonged to the creator of Excel. I thought to myself – Excel? That’s not exactly the hottest, newest invention of the day. But neither are the tech companies that get all the attention and trade at all-time highs these days! Apple and Microsoft are 40 years old, which means they were around before parents of most millennials even met. Amazon and Netflix are over 20 years old, Google is not far behind. Facebook is 12. They all innovate and continue to change our lives, but they are by no means new to the game. Instead, these few highly prized companies focus on trying to prove they can still grow despite their maturity and immense size. Investors seem to be following along for lack of other compelling tech options. Has innovation taken a pause then? So on the one hand, former innovators are decades-old companies now. On the other hand, attractive new business is scarce, constrained by a slump in the VC market, a weak IPO backdrop, and concentration of funding on the so-called billion dollar unicorns. You could conclude that innovation has never been weaker, especially when you look at the productivity growth which is usually driven by innovation. 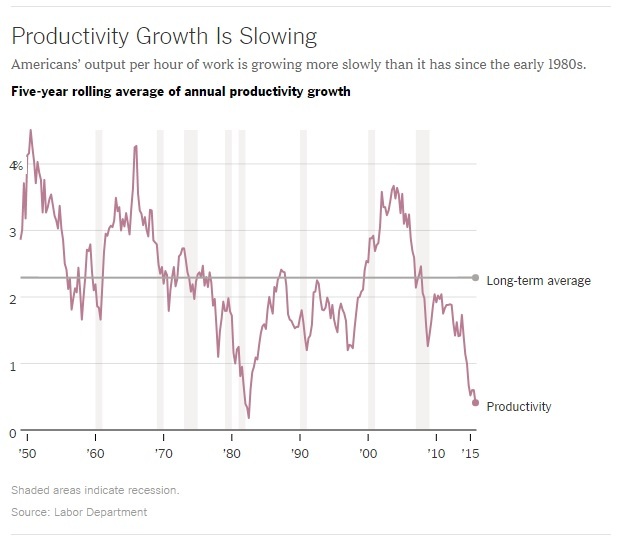 According to official labor statistics, 2011-2015 has been a five-year span with the slowest annual output per hour of work growth since 1977-1982 — far below the 1950s. Yet what may seem like pauses in IPO activity and productivity growth may be deceptive, masking the pace of true innovation whose benefits we are yet to see. The current dry spell for IPOs and headwinds for VCs may be coming to an end. In an interview in The Atlantic (6), Bill Gates said: “I want to meet this guy who sees a pause in innovation and ask them where have they been. The pace of innovation today is faster than ever.” He also reminds us that when innovation is happening fast enough, it sometimes shrinks GDP by disrupting industries (example: the Internet damaging the newspaper industry) or increasing costs (example: medical technology). “Take the potential of how we generate energy, the potential of how we design materials, the potential of how we create medicines, the potential of how we educate people, the way we use virtual reality to make it so you don’t have to travel as much or you get fun experiences,” Bill Gates added. Artificial intelligence, automation, genetics – these are all fields booming with innovation. The Wall Street Journal reports that “science is stepping up the pace of innovation” (7). –and finally digitization of matter (physical objects can be printed which transforms industrial manufacturing and creates new opportunities). WEF industry insiders’ survey tells us that tipping points in each of 21 identified transitions will occur in the next 10 years – among them is the first artificial intelligence machine on a corporate board. If that’s the case, the next 10-20 years seem far more promising for venture capital, IPOs, and public investors looking for new investment opportunities. With the early 21st century’s longstanding bull market moving around to the rear-view mirror, this may be a good time for reflection on the long-term dynamics driving the appetite for stocks and their prices. Baby boomers’ long-term appetite for stocks and the shortage of big IPOs may have boosted the markets beyond the obvious macro tailwinds. Both those trends are about to reverse. Baby boomers will be cashing out, while a pick-up in innovation may translate to a new wave of IPOs. As contrarian investors we pride ourselves on pointing out major shifts in long-term trends. These are two that might define the investment backdrop for the next 5-10-20 years. Perhaps there is a silver lining behind those two reversing trends. With more subdued demand, and probably more abundant supply of new companies, we might be finding more of what we are always looking for: promising investments at attractive prices. “Science Is Stepping Up the Pace of Innovation – Big advances in astronomy and genetics” by Alison Gopnik (WSJ, Jan 1, 2016). Deep Shift Technology Tipping Points and Societal Impact, World Economic Forum Report, September, 2015. This presentation and its content are for informational and educational purposes only and should not be used as the basis for any investment decision. The information contained herein is based on publicly available sources believed to be reliable but not a representation, expressed or implied, as to its accuracy, completeness or correctness. No information available through this communication is intended or should be construed as any advice, recommendation or endorsement from us as to any legal, tax, investment or other matters, nor shall be considered a solicitation or offer to buy or sell any security, future, option or other financial instrument or to offer or provide any investment advice or service to any person in any jurisdiction. Nothing contained in this communication constitutes investment advice or offers any opinion with respect to the suitability of any security, and has no regard to the specific investment objectives, financial situation and particular needs of any specific recipient. Any reference to a specific company is for illustrative purposes and not a recommendation to buy or sell the securities of such company.